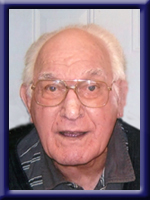 DOREY – Robert E., “Bob”, 91, of Liverpool passed away peacefully in Queens General Hospital, Liverpool on Tuesday, August 5, 2014. Born in Halifax, he was a son of the late Simon E. and Sybil E. (Young) Dorey. Bob was a veteran of the Second World War serving as a gunner for the Royal Canadian Army Corps protecting Halifax while on McNabb’s Island and St. John’s, NL and served for 3 and a half years overseas. He was a former employee of Bowater Mersey Paper Company, Brooklyn, Michelin Tire, Bridgewater and worked in the office of the local Imperial Oil Distribution Centre. Bob loved music, especially playing guitar and doing woodwork and carpentry; building his own home and doing masonry. He was a member of the Liverpool congregation of the Jehovah’s Witness. He is survived by his wife of 64 years A. Bernice (Manthorne), his daughters Marilyn (Ivan) Huskins of Port Mouton, Maryann (Eric) Whynot of Liverpool, his sons Borden (Barb) of Mersey Point and Carl at home. His grandchildren Daniel and Jonathan Huskins, his sisters Florence Foster and Mildred Dorey, both of Liverpool, his brothers Gordon “Gus” (Ethel) of Liverpool and Vernon (Maxine) of Shelburne. He was predeceased by his sister Pearl Anthony and his brother Arthur. To Marilyn and Igan, we were so sorry to hear off your Dad’s passing. We send our condolences!! So sorry to hear about your Dad. You are in my thoughts. Bob was a wonderful man we give our condolences to the families. Dorey family: We were sorry to hear about Bob. Our thoughts and our prayers are with your family. To all Bob’s family, my sincere condolences, so sorry to hear of Bob’s passing, he was a great man, loved by all. .
We were so sorry to read of your Dad’s passing,our condolences to you all at this time.You are in our thoughts and prayers. We are so sorry to hear of Bob’s passing. Thinking of you all at this difficult time. I am sorry to learn of Bob’s passing. Sending my deepest sympathies at this sad time. So sorry to hear of Bob’s passing. I really enjoyed the visits with him. He will be greatly missed by all. I never really had the chance to say goodbye gramp,,so I guess I get to say it now,,it’s going to be hard walking in the house and not seeing you there,,You always used to say ” May the good lord take a liking to you Bobby”, well gramp I think he did,,he took a liking too you…i’ll miss you and love ya…Goodbye for now,gramp,i’ll c-ya later..
To the Dorey Family: We are so very sorry to her of Bobby’s passing. He has been a great neighbour to lend a hand and a wise word. He will be missed. Marilyn I was so sad to hear the passing of your Dad, Hope everyone is doing well. He sure was a giving man. Our condolence to everyone at this time. Our thoughts and prayers are with you all. We are so sorry to hear about your Dad-such a nice man. Our deepest sympathy on the passing of your father. Our thoughts and prayers are with you at this time. To the Dorey Family: Please accept our most sincere thoughts of sympathy. It is very difficult to say good bye to our loved ones. May you take some comfort in knowing so many share in your loss. Treasure the memories you will always have in your hearts of a very kind and gentle man whose soul has now been turned over to God. Thinking of you all. I always remember him up at my nan and bump’s house, when I was a young girl, when him, and pearl, and billy, bump, and probably more, would get together and play their old music. I will miss him, and remember my fond memories of and with him. So sorry to hear of your loss. Please know that you are in our thoughts, and take care of each other. Our thoughts and prayers go out to family and friends. To Marilyn and Maryann sorry to hear of your dad’s passing. Haven’t seen you ladies since we attended school together but thought of you kindly when I saw his passing. To Bernice & family, so sorry to hear of Bob’s passing. He was a soft spoken & kind Man. May God give you all, the comfort you need to get through the dark valley. My condolences to the family. I will keep you in my prayers. We will keep our fond memories of music shared with Bob over the years. Junior always playing music with Bob. Our thoughts are with your family. So sorry to hear of your Dads passing. You are in our thoughts and prayers. Sorry for your loss,my friend.It makes for difficult times when you lose a loved one. Take care: with our sincere sympathies Paul and Cathleen. So sorry to hear of your loss, our thoughts and prayers are with you at this difficult time. I would like to extend heartfelt sympathy to the family of the late Robert Dorey. So so sorry to hear of the passing away of Bob…. Hold on to your memories and have faith in knowing he will only be a sleep a short time. .. He is in Jehovah’s memory. I am sorry to hear of Bob’s passing. He was a great person to visit and always had such a sense of humor to share.He will be missed.